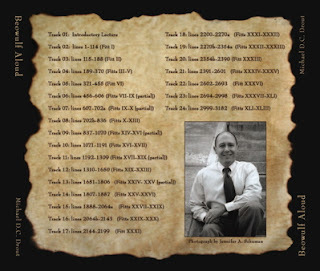 I've just posted the final segment of Andreas over at Anglo-Saxon Aloud, so the entire poem should now be able to be downloaded either from the site or from iTunes. I found recording Andreas very challenging. The poet uses some formulas and other set pieces that are similar to Beowulf, but they never completely felt right when I was reading them. I found myself getting tangled or losing the rhythm much more in Andreas than any other poem, even Christ and Satan. But in terms of content, Andreas is really interesting, and if you haven't read this poem, I recommend it, even in the S.A.J. Bradley prose translation: it contains all kinds of weird and interesting things, from cannibalism to drugs that drive people insane to rivers pouring out of marble and drowning the bad guys... God Himself makes a number of appearances, some of them in disguise. I have read Andreas many times since first reading it in grad school, but I still don't know what to make of it. Next up are a few short poems--"Fates of the Apostles," "Soul and Body I," the excitingly named "Homiletic Fragment I" and the great "The Dream of the Rood." Then the Vercelli Book poems conclude with Elene, about Saint Helen and the finding of the True Cross. That poem is almost as long as Andreas and possibly even more interesting. I estimate that I'll finish the Vercelli book sometime around mid to late June. The Exeter Book will take at least the rest of the summer. By the way, a few people have been kind enough to ask if they can use these recitations in their Old English classes. Of course! It's what they are there for. I also intend, once the entire recording process is done, to put them on CDs so that people can buy the entire ASPR as a set. But until then (and even after then), everything I've recorded and edited is available at Anglo-Saxon Aloud, except for the Beowulf recording, which you can buy at Beowulf Aloud. But, I only have 1 more undamaged Beowulf Aloud left from the first pressing. Another print run is in progress. Tiruncula writes about Kalamazoo feeling different this year and attributes this change not to her new affiliation with a fancy-pants university, but to having several cohorts of grad students at different stages in their careers at the conference. In this post Dr. Virago and her commenters discuss the complexities of the dance, noting that a person's relationship to that event changes with the years as well. Medieval Woman talked about being pretty much filled up with conference by Saturday afternoon and skipping the dance. New Kid on the Hallway discussed how there can be a conference with >600 sessions and yet so few that you are excited to attend. I recognized a lot in those posts. I've felt exactly the same ways at other times. Kalamazoo, because it is so large, because of the dance, and the dorms, and the continuity year after year, works as some kind of psychic amplifier. There was one year when, after listening to a paper that went on forever speculating about how many lines are missing from the beginning of Judith, I just had to get out of there. Luckily, Jenny Adams, who was sharing a ride with me, had just at that point also gotten fed up, so we drove back to Chicago and then I felt stupid for missing the dance. Kalamazoo for me is now a lot more pure fun. I enjoy seeing my undergraduates show up as successful grad students, and I like meeting people I've otherwise been introduced to at invited lectures, etc. I have enough friends there that I'm always rushing to see one or the other, and this year a couple of people whose work I really admire were willing to sit down and talk about work (not job possibilities, gossip, job shuffling; just intellectual work--it was great!). However, this year there was a new feeling, and it was not entirely a pleasant one (though I would have guessed it would be). That feeling, I think, was a kind of fear. At least three times, people came up to me to talk and said that they were using my work. Two of them were dissertations, and one is a book-turned-into-a-dissertation. This is, of course at one level very gratifying, and my enormous ego enjoyed it a lot. But I walked away from each discussion with my heart pounding and sweat running down the back of my neck, and I didn't figure out why until later. I realized that really until now I had been unconsciously assuming that everything I published, even at the highest levels, was fairly likely to be wrong but that this was ok, because at some point a senior person would come along and say "no, not exactly," and fix it. 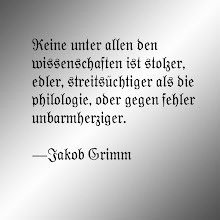 Yes, even for work that's gone through double outside anonymous review, or appeared in JEGP or Studies in Philology or Neophilologus or Anglo-Saxon England, I've been unconsciously assuming that the grown-ups will eventually come along and straighten everything out. Now I realize, in a way I hadn't before, that at least one or two (possibly exactly three) people have read my work working under the assumption that it's right and that they can build from it. I had no idea how profoundly scary that would be, but it certainly gives me a nice adrenaline shock when I think of it, even right now. Hanging on the wall in my office is a quote from Max Planck: "new scientific truth does not triumph by convincing its opponents and making them see the light, but rather because its opponents eventually die, and a new generation grows up that is familiar with it." I have always found this line encouraging when struggling to get people to engage with my ideas. All of a sudden you want the grown-ups back. And thinking of yourself as one of them is not a very comforting thought. I think this was all brought home even more by the memorial session for Nick Howe (I have my own two "this is how unbelievably generous Nick Howe was..." stories, but I'll put those in another post), the fact that Nick Doane is retiring from Wisconsin, and Steve Glosecki's untimely death. These people, and Patrick Wormald and Phil Pulsiano in previous years, weren't tottering ancient scholars. They were the very active heart of the field. And I know that I, and my colleagues of the same age and experience, will just never be capable of taking their places. And yet, due to the structure of academia, in some weird way new generations of scholars, who don't know any better, will assume that we have. I'm sure this is all related to my own anxieties about becoming Department Chair, and others' experiences are likely to be very different, but for me, right now, getting the things I have always wanted--real engagement with my ideas for what they are, not where they come from--is turning out to be one of the most intellectually frightening (and with that, exhilarating) times of my life thus far. But I close by saying that I will not grow up and will continue to stay in the dorms. Do you realize that, if you've been to more than ten Kalamazoos, that you've spent at least a month of your life in those dorms? The day I give up and move to a hotel with a real bed, an unshared bathroom, and no rooster outside my window is the day I am officially old. So much to write, no time to do it. I returned from Kalamazoo to Mother's Day, a pile of laundry, a Red Sox game, and a huge steaming heap of grading. I am only now digging out, and not so efficiently, either. But before the moment passes, this is a good time to make a comment or two. The actual details, including the blogger meet-up (which was fun) have been better discussed by others: Scott Nokes (scroll down), Another Damn Medievalist (Blogenspiel), Medieval Woman (whom I knew in a completely different context), Tiruncula (more on later), History Geek, Shana Worthen of Owlfish, Lisa Spangenberg, Elisabeth Carnell and others. I was also moved into a kind of awed awkwardness by meeting Teresa Nielsen Hayden of Making Light. In the tradition of weird things happening at Kalamazoo, I was woken by a rooster on Friday morning at 4:30 a.m. I assumed I dreamed this, but then I was talking to a woman who works on staff and she told me that there are some people who have backyard chickens who live off campus near the Valley dorms. So it really was a rooster: the first time I've been woken up by one. Just another surreal Kalamazoo moment. I'm glad that a couple people (Behold a Pale Horse and Scott Nokes) at least liked my paper with the plastic animals. It was a lot of fun to give, but because there was no time for questions, it was hard to tell whether people were convinced at all or just liked, well, the plastic animals. The papers I attended were very good, although all the things I wanted to see were at the same times. Also, this year everything I had to go to was on alternating sides of the campus: first Fetzer, then Valley III, then Schneider, then Valley II, then Bernhard. Got a lot of good exercise, though. Best part of the conference was getting a chance to talk to my former undergraduate student who has gone on to great things (and who will be teaching in my department this fall) and to catch up with people I'd met previously. Next best part was to say to a graduate student "Oh, you really need to meet Christina Lee, who is working on that" and, not 30 second later, have Christina Lee walk by and say hello. One of those weird Kalamazoo coincidences. Most embarrassing moment: at dinner with Don Scragg and others, I started in with "What did you think of Drew Jones' brilliant piece in the new Speculum." No one else had read it. "What is it about?" asked Don, not unreasonably. And then, my friends, I had a complete Alzheimer's moment that lasted a very, very long time. I could not, for the life of me, remember the name of the text or the author. So I basically said "Hey, wasn't that article great? Can't remember what it's about, though." Very sad. Two hours later, I suddenly recalled that it's on Odo of Cluny. How hard is it to remember Odo, I ask you? Almost as bad, and demonstrating how sleep deprivation in dorms that are worse than the prison Paris Hilton is going to leads to poor thinking, was my brain's performance at one interesting paper. About 2/3 of the way through, the presenter started talking about a medieval commonplace of a serpent with a jewel in its head that presses its ear against a rock and then tucks the tip of its tale into its other ear to block out temptations, etc. Interesting, right? Well, all I could think about, for the remaining five minutes of the paper, was "Snakes don't have ears." That particular problem so consumed my stupid brain that I totally lost the line of argument and didn't understand what the paper concluded. I did manage to buy a manuscript fragment and leaf for the Crazy Sheep DNA Project, a Roman coin for my daughter, and the conference copy of Mechthild Gretsch's Ælfric and the Cult of Saints (I never get the conference copy of books that I really want, so I was very happy). Also, thanks to Phil Kaveny, I sold all of my copies of Beowulf Aloud, giving me a lovely I-told-you-so moment with my beloved spouse (these are quite rare). The dance was also fun. I had a chance to chat with Another Damn Medievalist and dance with various friends, old and new. I still think that the dance should have been painted by Hieronomous Bosch (I think Korncrake would agree), but I always have a good time and I only know one person who left the profession after bad choices at the dance. It is a much more civilized event now that it's no longer in the Valley dorms, and I think the distance from the dance to the dorms protects many marriages and relationships just as the cash bar protects many reputations. As James McNelis said: "When medievalists have parties, we rock!" It may be it's own kind of weird medievalist rocking (involving belting out Bon Jovi songs -- who knew medievalists like Bon Jovi? ), but it's rocking all the same. Try doing that, Americanists! If I can dig out from all the other work I'll try to write something substantive and respond to insightful comments by Dr. Virago, Another Damned Medievalist and Medieval Woman in particular, but until then: this was my 14th out of the past 15 Kalamazoos and, despite the fact that it falls at exactly the wrong time of year and always creates work and family hardship, I'll keep going. Because you really can't ever run out of fun things to do when surrounded by medievalists for four days. Thanne longen folk to goon on pilgrimmages... to Western Michigan, in search of friends, books, power and position, maybe love, and that one night during an otherwise far-too-tense life in which rhythmless people will dance frenetically to Beyonce's "Check on it." This year I go looking to buy a roman coin for my daughter and a medieval parchment for my research project. To visit with my old friends, to have dinner with a few mentors, to have a few meetings and some good company, and above all to sit in on papers that will give me good ideas for future teaching and research (the "New Voices in Anglo-Saxon sessions are almost always worth it for that alone). Unfortunately, when I come home, on the afternoon of Mother's Day, the lawn will be as high as an elephant's eye and no one will be mowing it but me. Ah, the sacrifices we make for Lady Philosophy. True, Boethius was executed, but did he ever live in a Valley dorm? Because it is unlikely that my pre-Kalamazoo post, if I can ever write it, will be as good as that by Kornkrake (though I'll try), instead I want to talk about what I'm learning by doing Anglo-Saxon Aloud. The first thing is that if the Junius Manuscript poems were occasionally outside of my comfort level (established with Beowulf, after all), then Andreas is way outside of my comfort level. Particularly at the beginning of Andreas, I regularly had difficulty at getting a rhythm going, at expressing the sense of a sentence through inflection, at even understanding exactly what was going on while reading on the fly (What is God's problem, anyway, with the whole disguise thing?). But when I got to the set pieces, many of those problems went away. Sea voyages, torture, destruction: those the poet did well and the meter matched the Beowulf meter with which I'm familiar. It definitely feels to me if Beowulf is the most effortlessly accomplished of the poems I have read thus far and that Andreas (and perhaps Christ and Satan) is derivative, with the metrical structure not being as perfectly internalized by the poet. I also am more convinced that Exodus is more like Beowulf than any other poem, far more like Beowulf than Andreas is, although Andreas has a much higher percentage of shared lines. But listen to the poems yourself (via Beowulf Aloud and Anglo-Saxon Aloud) and see what you think. And see you at Kalamazoo, I hope. Thank you to everyone who has purchased a copy of Beowulf Aloud. I hope those who have received it will post some feedback, and if anyone is still interested, I do have a few more copies available. Beowulf Aloud is my dramatic reading of the entire poem in Old English. I can sell the 3-CD collection, which includes every single line of the poem plus an introductory lecture, for 15 dollars US. Packaging and shipping to anywhere in the US is 3 USD, so the total would be $18.00. Overseas shipping will whatever it costs me, checked on an individual basis (but so far, not more than $5 to Europe) . You can use the button above for my PayPal account or use my PayPal address, mdrout@wheatonma.edu. I am also happy to take personal checks. If you are enjoying Anglo-Saxon Aloud, I think you will like Beowulf Aloud even more, as the sound quality is somewhat better because it was recorded, edited and mixed professionally. I was just reading the new Speculum (a journal my wife won't allow me to keep in the house, by the way) on Monday and came across Milton Gatch's review of Mechthild Gretsch's Ælfric and the Cult of Saints in Late Anglo-Saxon England. Now, as readers of How Tradition Works know, Mechthild Gretsch is the medievalist whose work I most admire. Her The Intellectual Foundations of the English Benedictine Reform absolutely changed my scholarly life (and I would be willing to bet good money that I am the only person in the world who has read it four times). So when I got to the part of the review where Gatch is ready to make some criticisms, I was ready to rise in defense of whatever it was that Gretsch had done. But instead, I found myself in total agreement with Gatch, who objects to the use of the verb "culted" throughout Gretsch's new book. Gatch attributes this usage to Gretsch's being German, and he's wrong about that, but boy is he right that "culted" is a barbarism (though he does not use those words). When I was in graduate school and reading all the then-current scholarship on the English Benedictine Reform, no one used "culted" as a past-tense verb. But sometime around 2000-2001, it started to show up everywhere. Phrases like "Swithun was culted at Winchester" became commonplace in Anglo-Saxon England and elsewhere. Before this time, people would write something like "a cult of St Swithun was started at Winchester." Now it's "was culted." In other words, the use of "culted" is a meme, one that has spread rapidly through the ranks of elite Anglo-Saxonists (though thankfully, nowhere else). I understand desire for shorthand, and I think that "culted" is marginally better than "imbricated" ("imbricated" is a bad metaphor, while "culted" is a bit of insider jargon with only one real meaning). But "culted" is still loathsome. It's ugly to look at, and it works immediately to alienate nearly all readers. It is also unnecessary, as scholars were able to write about the cult of the saints, etc. for a couple hundred years without using "cult" as a verb. Look, Milton Gatch has read more Anglo-Saxon scholarship than nearly any person alive. When he thinks the use of a word is due to the author's not speaking English as a native language, it's obvious that "culted" isn't helping with communication. I'm all for jargon when it's necessary or even particularly useful, and I love teaching my students to use "hapax legomenon" or "homoeoteleuton" in the appropriate situations, but "culted" is just too foul. Please don't use it any more.